The zoot suit was a style of dress that became popular during the late 1930s among young people, especially young African Americans and Mexican Americans, who were into swing dancing and jazz music. The zoot suit of the 1940s was full of scandal. Technically illegal due to the abundance of fabric needed to make it and the restrictions place by the war board it was the underground dress uniform of young, ethnic, rebellious men. These” swing kids” danced in jazz clubs, purchased their clothes on the black market and in L.A. caused a month long street war. Young people continued to wear the style and the suits soon became associated with delinquency and crime. Most wearers were simply rebellious youths, many in inner city urban areas like Harlem and Los Angeles, trying to form a culture all their own. The wearers of zoot suits were seen as being unpatriotic, and tensions between zoot-suiters and military servicemen stationed in California erupted in a week of violent street fighting in Los Angeles in mid-1943 that came to be known as the Zoot Suit Riots. The man’s zoot suit consisted of an extremely long and wide two button suit jacket with large notch lapels with huge shoulder pads worn over extremely baggy trousers that came well above the waist – about halfway up the chest. The pants tapered at the bottom to a very tight cuff at the ankles and were held up with suspenders. A plaid button-down shirt, tie, shiny leather shoes and a wide-brimmed fedora hat completed the look on the east coast. In the west, the tie and hat were replaced by hair greased back into a tail. 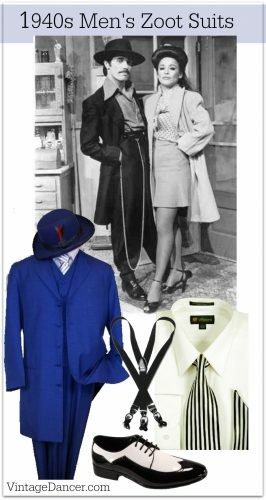 The zoot suit was usually wool and in black pinstripes, plaids or very bright colors like red, royal blue, yellow and purple. Some zoot suit styles featured a dark suit jacket worn over light zoot “chino” pants. The homemade jackets had very large patch pockets on either side. Extra wide and short ties, matching pocket square and big fluffy bow ties were most popular with performing musicians. When Malcolm X went to buy his first Zoot suit he recalled the salesman “picked off the rack a zoot suit that was just wild: sky-blue pants thirty inches in the knee and angle-narrowed down to twelve inches at the bottom, and a long coat that pinches my waist and flared out below my knees.” Malcolm also bought a blue hat with a four inch brim and feather, leather belt, and long gold-plated chain. parties to the new American “jazz” music. They wore double breasted pin stripe suits with high pinched in waists, extra-large lapels and carried a rolled umbrella. To archive the oversized suit look many economical young men purchased suits in a few sizes up and modified them to form the tight waist and shorter trousers. It is interesting to note that despite the Zoot style being considered unpatriotic during the war afterwards the style became the new men’s look of the late ’40s and early ’50s. Large double breasted baggy suits with high waists, pleated trousers and wide brim hats returned to fashion just as they were in the 1930’ but now with a taste of the zoot in them. 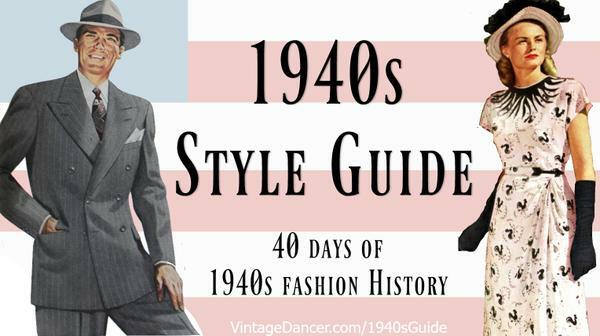 Today the is immortalized as the greatest 1940s fashion for men, especially with dancers. It is also the inspiration for African-American men’s fancy dress (for church and formal events. ) These modern zoot suits are really great alternatives to vintage or reproduction zoot suits for their outlandish style, bold colors, and affordability not to mention they are still modern enough to wear to any stylish party today (you will get a lot of attention wearing these suits.) They seem to be especially popular for 1940s themed weddings and vintage swing dance parties.